The last time I hung out with a toddler, she gifted my iPhone with a couple of new apps, and at least a dozen new princess-style selfies. The average 5-year old seems ten times more technology-literate than me; children are growing up in a world where everything ‘important’ is created, stored, accessed and backed-up on tablets, laptops, and phones. So what relevance could a live piece of theatre about scrapbooks possibly have? In the first few moments of the play, I wasn’t so sure, but by the end, I was completely convinced; though it took a little time, this was an original and very sweet production. Dr. Patricia Baker (Shona Reppe) is a scrapologist, a leading member of S.C.R.A.P. (the Society for Care, Repair, and Analytical Probing). As she explains, scrapbooks are books of scraps, and scraps are…anything interesting. 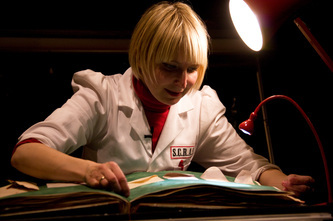 The performance rests on her one-woman exploration of a scrapbook in a scrapology laboratory. Working her way through, page by page, Dr. Baker tries to piece together who the scrapbook belonged to. The play highlights a ‘child’s-eye’ point of view – close attention to small, everyday things that become treasures. Children are never limited in their exploration of a newly-found object – such as instantly putting it in their mouth – and Dr. Baker does not shy away from these methods. She concludes, for instance, that the owner of the book was from the East Coast of Scotland, by licking the sand that falls from the pages. Touching, smelling and tasting what she finds, her imagination connects the dots and tells the story – she is Sherlock Holmes with a heart. The scrapbook itself is a living, almost breathing, artifact. Dr. Baker holds a stethoscope to its pages, even performing an operation on it. Conversations and every-day sounds from the past are stirred, sometimes so loudly that only a firm turn of the page will quiet them. Through Baker, objects collected in the scrapbook become people – a ballerina is simply torchlight on a feather dancing in the dark. What The Curious Scrapbook of Josephine Bean insists is that the human touch lingers on these tangible pieces of flotsam, in a way that no computer can replicate. The format is initially confused – part-presentation, part-scientific game show, part-detective story. There is a nod towards interaction, which could have been integrated more fully – the audience were, after all, ‘scrapettes’. However, as is so often the case in children’s theatre, the audience thrust their participation onto the production, engaging with Reppe’s always energetic and constantly charming performance. As the play warms into itself, the scrapbook gently reveals its secrets, finishing with an end that was, as Dr. Baker would say, truly ‘scraptastic’.